What is this Payment Guarantee for? 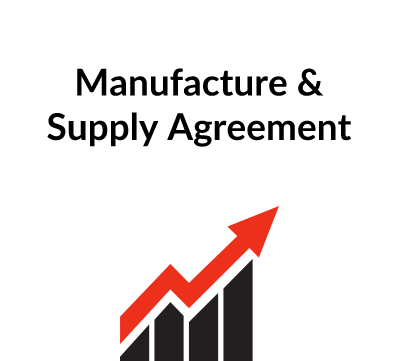 This payment guarantee is for use where the payment obligations of a company buying goods or services under a contract with a supplier are guaranteed by the buyer’s parent company or some other third party. The payment guarantee needs a clear statement of the guarantor’s obligations – i.e. an unconditional promise to make any payment that the buyer under the contract fails to make. Timing is important as well as the way that a notice requiring payment will be given to the guarantor. How long the guarantor will have this liability also needs to be spelt out. It will usually continue for as long as the buyer under the contract has a liability to the supplier. 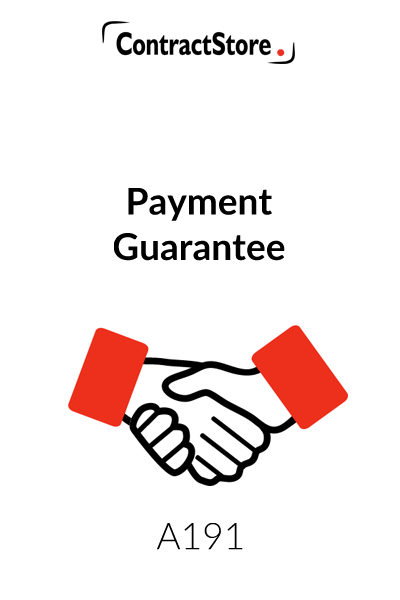 What detailed terms does the Payment Guarantee contain? Sometimes a supplier of goods or services is doubtful whether the buyer will be able to meet all his payment obligations. 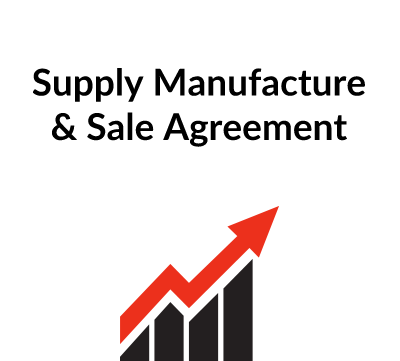 Especially where the contract is of a high value or fairly long term, the Supplier may look for security from the Buyer’s parent company or some other third party related to the buyer who can give the necessary assurances. Our form of Payment Guarantee is designed to deal with such a situation. The document is quite straightforward and contains six clauses setting out the rights and obligations of the parties. The introduction refers to the contract to which the Guarantee relates and then refers to the relationship between the Guarantor and the Buyer. If the Buyer is not a subsidiary of the Guarantor, the wording of (B) needs to be changed. Clause 1 contains an irrevocable and unconditional guarantee from the Guarantor to the Supplier that it will guarantee the Buyer’s payment obligations under the contract. 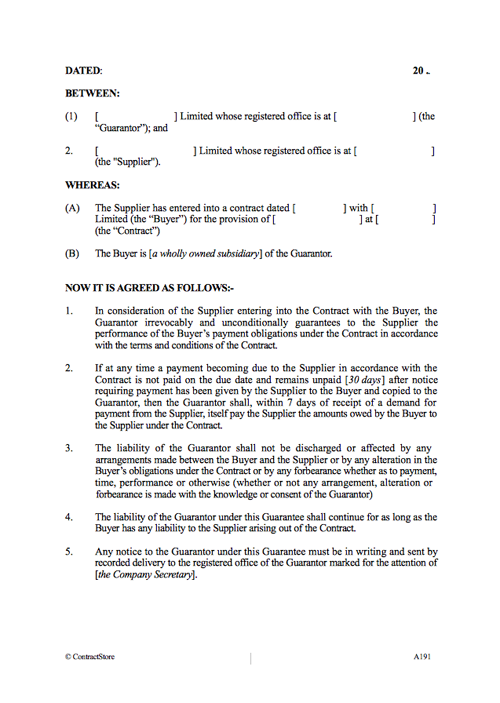 Clause 2 deals in more detail with the procedure by which the Supplier can obtain payment from the Guarantor. Under our wording, if a payment is overdue 30 days after a notice demanding payment, then the Guarantor has 7 days in which to make the payment directly to the Supplier. These periods should be changed if the 30 days or 7 days is considered to be too long. Clause 3 is a legal provision which makes it clear that if there is some change in the terms of the underlying contract, that change does not invalidate the terms of this Guarantee. 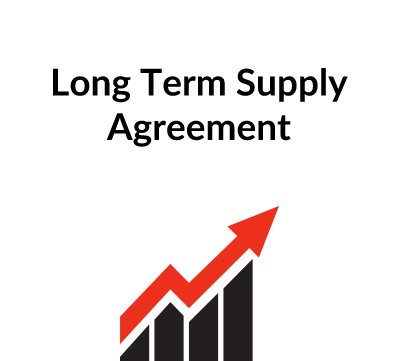 Clause 4 deals with the duration of the Guarantee: it continues for as long as the Buyer has any liability to the Supplier under the contract between them. Clause 5 deals with any notices that have to be given. Clause 6 specifies the governing law and states that if there is any dispute it will be referred to the courts. Under English law, the document should be signed as a deed by the Guarantor. This means either having the signature of two directors or a director and the company secretary, or having the document sealed with the company’s seal and then signed by one or more of the directors.